One day I wanted to make a spinach and cabbage salad, so I sent Joe to the store to buy a small cabbage. Alas, all they had was a large cabbage, so after I made the salad, I still had about three-quarters of the cabbage left. I didn’t want to make another slaw, and I didn’t want to just boil it up, although I do like plain, buttered boiled cabbage. I wasn’t in the mood for the old standby sweet-and-sour cabbage and tomato soup. So I looked online and found this recipe for a cabbage casserole, which turned out to be quintessential comfort food, perfect for a dreary winter day like today. It’s also very easy to make, though you’re left with a lot of pots to wash. If you don’t like the idea of using canned cream of mushroom soup, you can make your own sauce using fresh mushrooms and a very thick white sauce (you’ll want it to be as thick as canned cream of mushroom soup). The original recipe called for American cheese, but I think cheddar or Colby cheese gives a better flavor. This can be served as a side dish or as a main dish. Bake uncovered for 20 to 30 minutes, until the casserole bubbles and the breascrumbs are browned. Uh-oh: A typo in a previous post! Oh dear, a loyal reader just informed me of a typo in my post with the Chocolate Mousse recipe. My original directions called for 1 16-oz package of chocolate chips, and it should have been 1 6-oz. package of chocolate chips! 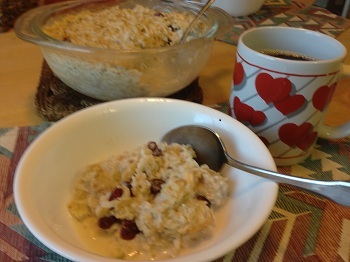 I have corrected it in the blog, so if you want to make this wonderful and easy recipe, it is now correct. And I apologize to anyone who tried to make it with the original instructions! In a blender, or with an immersion blender, mix the chocolate chips and boiling water for about 10 seconds. Add the egg yolks, liqueur and cinnamon and blend another 5 seconds. Beat the egg whites until they form stiff peaks. Fold the chocolate mixture into the egg whites until no streaks or lumps of white are visible. Spoon into dessert dishes or a 1-quart serving bowl. Chill for one hour or more. Serve with a dollop of whipped cream. Snap the ends off the green beans, but unless they are very long, leave them whole. Boil water in a medium saucepan and parboil the beans for 1.5 minutes; drain. Wipe the pan dry and heat the oil. Saute the garlic and mushrooms until the mushrooms release their liquid and soften. Add the pepper and cook for a minute or two, until the peppers soften somewhat; they should not be mushy but should retain a little crunch. You can do everything up to this point ahead of time. 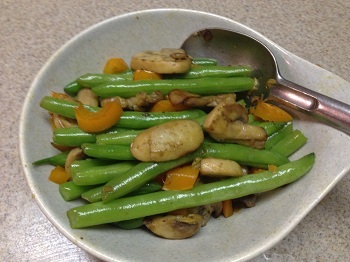 When you’re ready to serve, heat the vegetables until they start to sizzle, then add the green beans and cover the pot. Cook for just a few minutes, until the green beans are heated through. A kugel is a pudding. 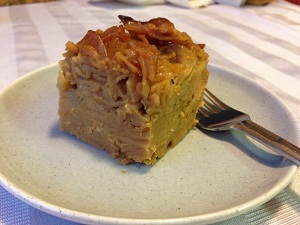 A Jerusalem kugel uses caramelized sugar, which gives it a nice, deep, brown color, lots of oil, and lots of black pepper, which makes it both sweet and spicy. Most recipes call for cooking the noodles first, then caramelizing the sugar and pouring it over the noodles, then adding the eggs. I used to do it this way, but it was a little tricky, because when the caramelized sugar hit the noodles, it tended to form chunks and not coat the noodles evenly. This problem was solved when I found a Jerusalem kugel recipe in the New York Times. It’s a little time intensive, but it’s easier to get a good result. You still have to be careful when caramelizing the sugar. If you let it go even 30 seconds too long, it will burn. And if you’ve never done it, you may not know what to expect. This is what happens when you mix the sugar with the oil and heat it: First the sugar will seem to dissolve, but much of the oil will remain separate. As the mixture continues to cook, it will seem to solidify as the oil is absorbed, and you’ll have clumps of moistened sugar. Keep stirring. Finally the sugar will start to melt and turn brown. Stir it constantly and watch it like a hawk. As soon as the color is golden brown, almost as dark as you want, pull it off the flame – I say “almost” because the hot syrup will continue to cook for short while. I make it a little differently than the original New York Times recipe, which calls for 12 ounces of noodles (actually, they call for a mixture of angel hair pasta and fettucine), ½ cup oil, 1½ cup sugar and 4 eggs. The Times also suggests baking the kugel in a Bundt or tube pan. but I prefer an oblong pan. This makes a very large kugel, enough to feed 12 or more. 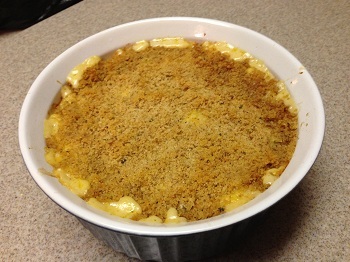 To make a smaller kugel, use 8 ounces of noodles, ⅓ cup oil, 1¼ tsp. 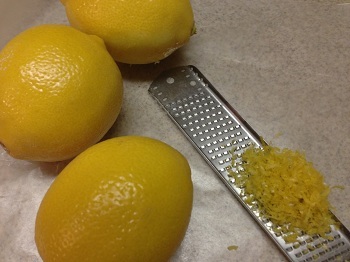 salt, ½ tsp. black pepper, 1 cup sugar and 3 eggs, and bake in an 8-inch square pan. Pour 6 cups of water into the pan with the sugar mixture and bring to the boil. The hardened sugar will slowly dissolve. Add the salt, pepper and remaining sugar. When the water boils, add the noodles. Cook until the water is almost completel absorbed/evaporated, stirring occasionally so that the noodles don’t stick to the bottom of the pot. Remove from heat and cool slightly, stirring occasionally to release the heat. When the oven is ready, add the eggs to the noodles and stir well. Pour into a greased 9 x 13-inch pan. Bake for about an hour, until the top is nicely browned. Cut into squares to serve. I got this recipe from my friend Ruth Marcus and altered it a bit. She called it moussaka, but it’s not like traditional Greek moussaka that is topped with a custard or béchamel sauce and baked. No matter, it’s delicious. I’m calling it Beef and Eggplant Ragout so moussaka lovers won’t be disappointed. 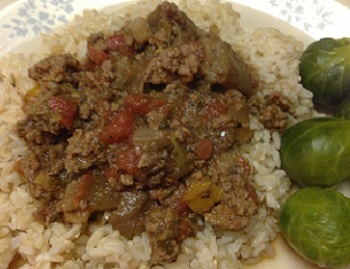 The eggplant disappears in the cooking, so it’s a good recipe to serve to kids who like meat and hate veggies. This recipe freezes very well. Preheat oven to 350 degrees. Line a cookie sheet with parchment paper and bake the eggplant until it starts to soften, about 15-20 minutes. Heat the olive oil in a large Dutch oven and sauté the onions and peppers a few minutes, then add the eggplant and cook until the vegetables are soft. Add the meat, stirring to break up clumps, until browned. Add the tomatoes, tomato sauce and spices. Simmer one hour on low heat. Serve with rice or couscous. It’s also nice served over spaghetti.